Mr. Jobs, my apologies, I didn't mean to interrupt you at home. I mean, obviously I did because I knocked at your door, but, you know—wait, were you watching So You Think You Can Dance? THAT'S MY FAVORITE SHOW TOO!! WHY ISN'T IT ON ITUNES?? Sorry for shouting. I won't do that again. I'll try not to spit, either, but I can make no promises there. I mean, I'll most certainly make earnest attempts, but I really don't want to mislead you. My saliva is not something that I can wield with 100% proficiency, and I want this meeting to be built on trust. Mutual trust. Anyway, my reason for showing at your door. Frankly, I wanted to know what your house smelled like. No, that's not my primary reason for being here. I view it as a sort of side quest that justified a face-to-face meeting rather than a more conventional email. And no, it's not nearly as creepy as your face is implying. My inquiry was a point of academic interest. Everyone's house smells different, an amalgamation of personal scent, furniture, general upkeep, pets and preference for food. And let me just say, I thought it'd smell like this. You know, kind of blue. Yes, I know blue is a color. I guess I mean, fresh, clean, but maybe even a bit sterile. Not in a bad way, mind you. And the hint of tempeh in the air is really quite welcoming. 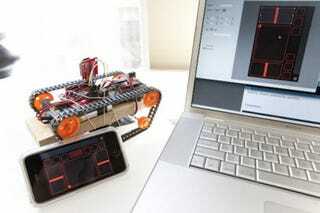 Sell every iPhone with an accompanying Arduino tank. Like this one. Boom.